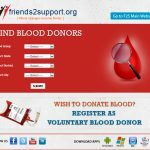 Friends2Support (F2S) is an Indian voluntary blood donation organization. It brings together voluntary blood donors and those in need of blood onto a common platform. F2S was founded as an effort to tackle the problem of blood unavailability at hospitals. The organization’s main aim is to change the society towards stronger solidarity regardless of caste, creed or religion. By organizing rallies, events and other activities the team promotes their concept and raise awareness. Essential tools for their work is the website and the new mobile applications which are connecting all stakeholders and are provided free of cost. Making use of contemporary technology Friend2Support wants to pave the way for a safer and better tomorrow. The mobile application is compatible with Windows, iOS, Android and Java. With its appealing design and layout, the application is comprehensible and easy to use even by people of low education level. Donors can register quickly by providing basic personal data while donor seekers have a simple search function at their fingertips.